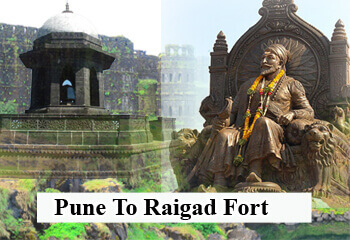 Pawar Travels provides you Raigad Tourism. The Total distance from pune to raigad is 120. Raigad is Owned by the government of india . The hill fort Raigad is situated in mahad, Raigad district. it was named after the mountain 'Rairi'. The places those are covered during the journey from Pune via Raigad are starting from Pune - 47 km -> Khamshet - 29 km -> Khopoli - 6 km -> Sajgoan - 42 km -> finally Raigad. The fort was built in 1030 by Chandrarao Mores which has an exicution point called seven tok a cliff from where the prisoners where thrown down to death. the area is now fenced off. A tour to Raigad is not completed without watching Raigad Meseum which is located at lower Station of the Raigad fort.the museum contains various pictures of the forts in Shivaji Maharaj's empire various aircrafts and wepons used for those historic fights.Raigad was Chhatrapati shivaji Maharaj’s capital, where maharaj was crowned (1674 AD) and where he died (1680 AD).